Another week, another round of links. Here we go!Something strange is afoot in Pennsylvania. Last week, we linked to a story on the first Whig elected to public office in Philadelphia in over a century and a half; now the Harrisburg Patriot News (formerly the Patriot & Union) has issued a retraction of an 1863 editorial that summarized the Gettysburg Address as “the silly remarks of the President” deserving “a veil of oblivion.” Craig Silverman at Poynter has a short write-up on the episode. Speaking of the Gettysburg Address, the New York Times Arts Beat reports on Ken Burns’s latest project: inviting celebrities and Americans of all stripes to record themselves reciting Lincoln’s famous speech and upload the recording to http://www.learntheaddress.org. The project grew out of Burns’s forthcoming documentary examining a program at the Greenwood School (“a school for boys with severe learning disabilities”) that encourages all students to memorize and recite the address. The Times‘s report also features Stephen Colbert’s dramatic recitation. Another episode of “Ask a Slave,” the youtube series in which actress Azie Dungey answers questions she’s been asked by tourists while working at George Washington’s Mount Vernon historic site, went up on Monday. Questions include “Where do you go on vacation?” and “What was the worst day of your life?” (the answer to the latter: “The day Thomas Jefferson came to visit.”). While we’re on the topic of using humor to make important points about less-than-edifying aspects of America’s past, be sure and check out Fusion‘s take on “Why some Native Americans can laugh about Thanksgiving.” Cristina Constantini chronicles the efforts of the Native American comedy troupe known as the 1491s to raise awareness of both Thanksgiving’s history and stubbornly persistent offensive depictions of Native Americans today. Yale University professor Alyssa Mt. Pleasant is quoted therein. A couple of items of potential interest from the folks at Religion in American History: Charity Carney, author of the excellent Ministers and Masters: Methodism, Manhood, and Honor in the Old South, is the latest historian to weigh in on 12 Years a Slave. She considers the treatment and portrayal of religion in the film, concluding that it “accomplishes the difficult task of conveying [the] diversity [of antebellum Southern Christianities] while also portraying religion as one of the most valuable and dangerous tools in the slave South.” Earlier in the week, Paul Harvey provided a helpful overview of the latest issue of the Journal of Southern Religion, which includes an article on “Evangelicals and domestic felicity” in the antebellum South and a review of Glenn Crothers’s book on Quakers in northern Virginia in the 18th and 19th centuries. Over at After the American Century, David Nye posted his reflections on Leo Marx’s The Machine in the Garden, recently delivered at MIT in celebration of the book’s 50th anniversary. In the world of historical re-enactment, the New York Times reports on plans for a reconstruction of L’Hermione, the ship that carried Lafayette (back) to North America in 1780. The ship is scheduled to sail from France to the United States in 2015, and will make stops in Yorktown, Baltimore, Philadelphia, New York, Boston and Halifax, Nova Scotia. 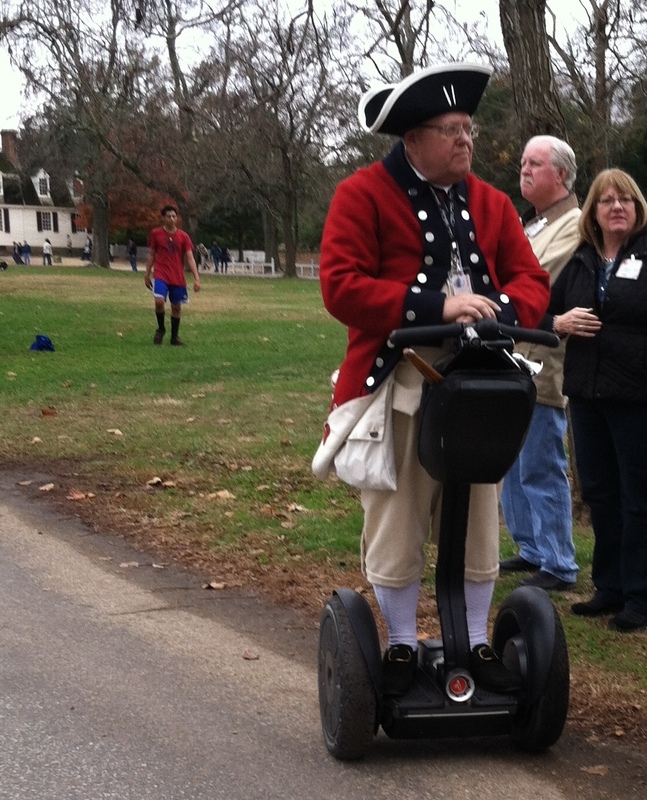 Meanwhile, I spent yesterday afternoon with my family in Colonial Williamsburg. I didn’t see the actor who plays the Marquis, but I did encounter the fellow pictured at left, apparently a lieutenant in the 35th Royal Regiment of foot <Segway>. We’ll wrap things up with a list of links on the technology/digital humanities front. At TechCrunch, Matthew Panzarino notes that “Twitter will [now] let you create custom timelines based on topics, hashtags and more from Tweetdeck,” which will “allow people to create powerful streams of information out of Twitter’s public firehose, effectively allowing anyone to curate individual streams of data tailored to a topic.” The Harvard Gazette, meanwhile, describes the efforts of Harvard’s Colonial North America (CNA) project to digitize thousands of documents, including “about 6,900 linear feet — around 30 million pages — date from the 17th and 18th centuries.” And NPR’s Morning Edition featured a report on images of slavery in Brazil. The write-up at their website includes several of those sobering and somewhat startling photos, most dating from the 1860s-1880s. Has anyone considered the roots of the constitution in earlier American history? People lived in the colonies from 1607 in Virginia, and the thoughts of the constitution writers reflect the trials and experiences of building a society and economy over many generations.